For the TV series, see The Phil Silvers Show. Sgt. Bilko is a 1996 American comedy film directed by Jonathan Lynn and written by Andy Breckman. It is an adaptation of the iconic 1950s television series The Phil Silvers Show, often informally called Sgt. Bilko, or simply Bilko, and stars Steve Martin, Dan Aykroyd, and Phil Hartman. Master Sergeant Ernest G. Bilko is in charge of the motor pool at Fort Baxter, a small United States Army base that develops new military technology. Exploiting this position, he directs a number of scams, ranging from gambling to renting out military vehicles. His commanding officer, Colonel John Hall, overlooks Bilko's money-making schemes, as he is more concerned with problems in the hovertank that the base is designing. Major Colin Thorn, an officer from the U.S. Army Inspector General's office, arrives at the camp and begins to scrutinize Bilko's record. Officially, Thorn is at Fort Baxter to conduct a general inspection and determine if the base should remain open in light of recent defense cutbacks. He is also determined to get revenge on Bilko to settle an old score the two have from Fort Dix, where Thorn was nearly court-martialed after a fixed boxing match which resulted in Thorn being shipped off to Greenland in the belief that he tried to fix the fight. Bitter and unprincipled, Thorn is not above breaking the law to ruin Bilko. He attempts to steal Bilko's long-time fiancée Rita, whom Bilko has stood up at the altar more than a dozen times. Rita is tired of waiting and gives Bilko 30 days to win her back or lose her for good. 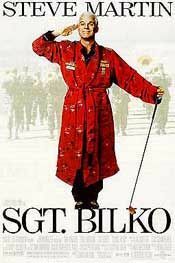 Bilko, with the help of newly assigned Private First Class Wally Holbrook, devises a means of avoiding Thorn's attempt to transfer him to Greenland: He rigs a demonstration of the base's malfunctioning hovertank, staged before a four-star general and numerous dignitaries. Since Thorn had deliberately tried to sabotage the tank the previous night, he confronts Bilko, Hall, and the general, loudly insulting Bilko and Hall. While ranting, he confesses to sabotaging the hovertank. Thorn is sent off again to Greenland. The last day of Rita's ultimatum has come. Just as she sadly begins to write Bilko off forever, Rita hears men outside her house, serenading her with one of Bilko and her favorite songs. Looking out, she sees Bilko and his platoon. Bilko asks Rita to marry him, and she accepts. The next day is their day wedding day, but Rita shows up late, revealing it was daylight savings. After they played another card game, they finally get married, unknown to Bilko, Rita is holding many aces in her hand. Both Albert Brooks and Michael Keaton turned down the role of Bilko, and Robin Williams and Billy Crystal expressed interest in it before the role finally went to Martin. On the film-critic aggregator Rotten Tomatoes, Sgt. Bilko received a 32% positive ratings. It also failed at the box office.